Reese’s Ice Cream Cake Recipe, Perfect for Summer BBQ’s or birthday parties, Use your Favorite flavor of ice cream to mix it up! I have a FANTASTIC new Reese’s Ice Cream Cake Recipe for you to try today! 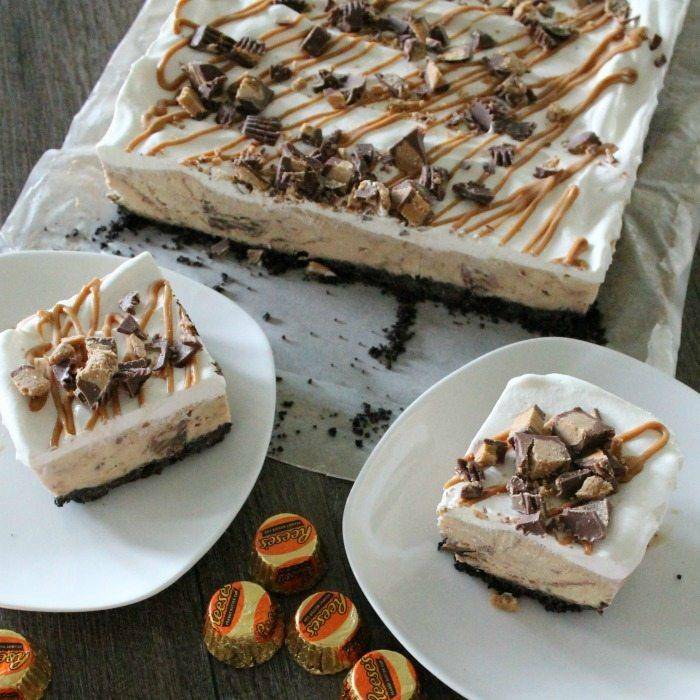 You’ll love this delicious Reese’s Candy Ice Cream Cake, it’s super delicious! If you’re looking for a great recipe for your family to try for dessert, then look no further, everyone will love this amazing recipe. This recipe is easy to make and it tastes AMAZING so be sure to give it a try today! If you’ve got any fans of Reese’s Peanut Butter Cups in your family then they will love this great Reese’s Cake Recipe made with ice cream. You’ll love how easy it is to make and it tastes delicious. If you’ve got any birthdays coming up or special occasions that you need a dessert for, then be sure to give this great ice cream cake a try. My kids absolutely love this ice cream cake and i’m a pretty big fan as well. It’s super delicious and you can’t beat the crust make of oreos, so if you like chocolate and peanut butter, this recipe is perfect for you! Head on over to your local store to grab these ingredients to make this amazing recipe today. In a Food Processor Crush Oreos, Add in 1/4 Cup Melted Butter and Pulse until Mixed. Press Oreo Mixture into the bottom of a 9×13 baking dish that has been sprayed with cooking spray or lined with parchment paper. Melt 1/2 Cup of Creamy Peanut Butter in an Icing Bag for 20 seconds. Cut the tip off and drizzle half over oreo mixture. Freeze for 2-3 hours or longer until ready to serve. Let me know what flavors you try! I’d love to hear all about it! Simply wonderful recipe, loved it, great to offer at friends’ meetings.